The official opening of the “Business Women’s Space”, a co-working center for support of social innovations, women entrepreneurship and start-up, took place on March 29, 2019. The event gathered women entrepreneurs, both current and prospective, male and female representatives of NGOs, businesses, and state institutions. The participants were greeted by Valerii Edeliev, Zaporizhia Deputy Mayor, Svitlana Krugliak, Regional Coordinator for PLEDDG Project in Zaporizhia region, Svitlana Zhavoronkova, PLEDDG gender equality consultant, Iryna Dudnik, Director of Zaporizhia Regional Employment Center etc. 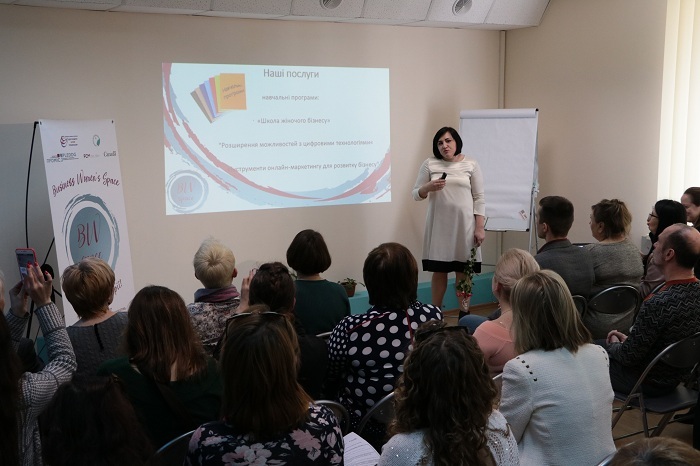 The manager of the project, executive director of ZNGO “CDC “Professionals”, Inna Boyko, presented the center’s services, training programs, which would be implemented in the near future with the aim to facilitate the development of small and medium-sized businesses in Zaporizhia. During the event women entrepreneurship success stories were shared, a business game on partnership and strategies in communications and an entertainment event for children were held, which was followed by a delicious banquet and a conversation with the organizers. The event gathered 50 people. The activity of the co-working center “Business Women’s Space” is aimed at reducing unemployment among Zaporizhia residents, initiating and scaling businesses, developing the city’s social infrastructure, promoting SME development, in particular, women’s business. The cherry on the cake was a children’s room where busy parents can leave their kids to be entertained by experienced animators. The project “Business Women’s Space” – a co-working center for support of social innovations, women entrepreneurship and start-ups” is implemented by an NGO “Center for Career Development “Professionals” in partnership with another NGO, “Ukrainian Women”, in the framework of the program “Project for development of small and medium sized entrepreneurship in Zaporizhia for 2017-2021”. The project is funded by the SME Development Support of the international technical assistance project “Partnership for Local Economic Development and Democratic Governance” (PLEDDG), which is implemented by the Federation of Canadian Municipalities (FCM) and funded by Global Affairs Canada. For more information on PLEDDG Project visit their website www.pleddg.org.ua.